“Top” lists are always a small act of futility. There is so much variability in the human body, and a countless variety of exercises, it is grossly difficult to pull out some singular exercises and call them the best. The key with smart training is tailoring exercises to the individual, their goals, and their capabilities. This list of drills and exercises to improve your surfing, all hit dynamic aspects of movement. Strength, mobility, complexity, coordination and control. That’s a list of goodness right there if you can get your body capable of all that, and apply it to your water time. Keeping your body in a physical state so you can get into the ocean and do what you love to do, that is what lies at the center of this whole “surf -fitness” shift. At it’s foundation, it’s simply keeping your body, or restoring your body, to a better physical state. Improving towards a more capable physical state, which is “athletic capacity”, is what legitimate training is about. Make your body stronger, powerful, flexible, and more durable, so you’re not self-limiting the skill and art of surfing. **This list is far from complete, but what all these movements have in common is they hit the athletic components that surfing demands. 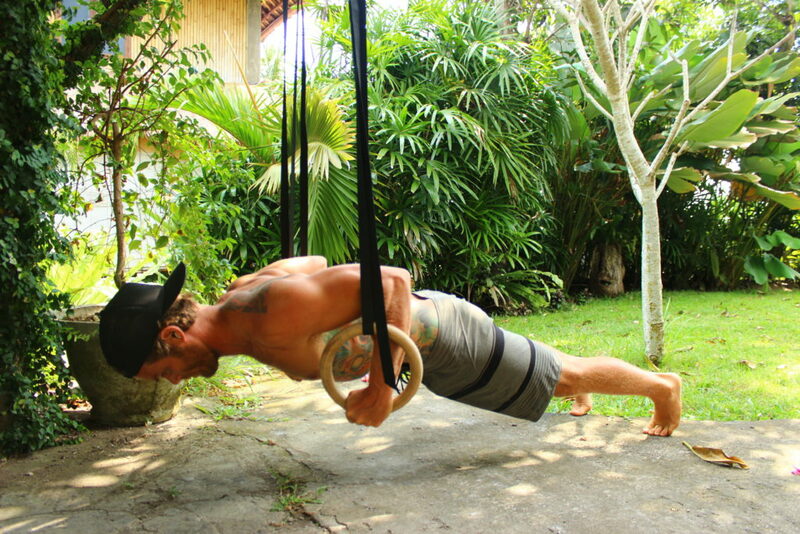 Strength, power, flexibility, endurance, coordination, and balance. These fundamental exercises, if done with technical precision, will make you more athletically capable, and lay the groundwork for far more advanced training in the future. You’re a surfer, you should be training smart, dynamically, and efficiently. The squat pattern is crucial to surfing. Think of crouching through a bottom turn, landing a high speed floater, or holding through a full rail turn. You need a strong lower body, you require healthy joints to move through full range of motion, and you need to produce and absorb some very large forces. Needless to say, it would be beneficial to train a squat pattern. When squatting efficiently, and that’s the key word, you’re developing a stronger lower body that moves efficiently through multiple joint complexes. The ankle, knee, hip, and spine all have major contribution to the majority of movements you’ll see out in the water. Force production and absorption, joint control, alignment, and strength, they’re all aspects that that are truly relevant for long term durability, surfing, and athleticism. Upper body pulling strength, that’s the goal here. A healthy and strong upper body. Vertical pulling on the rings not only reinforces optimal mobility of the shoulder, but layers high amounts of the strength and control. It doesn’t take long in any lineup to see guys missing waves due to weak paddling. Getting into the dreaded two armed scrape, desperately sitting on top of a lip. Get stronger! Your surfing deserves it. Build strength and mobility in the upper body so you’re able to apply some force with that paddle pulling stroke. Yes, for those that say a vertical pull doesn’t have the same mechanics as a paddle stroke, I agree with you. But, becoming efficient at ring chin-ups provides so much other benefit to the health of the upper body that it’s a critical piece of training. Take the strength developed in this drill and apply it towards higher speed pulling work, more volume, or more intensity. It looks bizarre. It looks like it has zero carryover to a surfer. It looks good! Incredible mobility, joint control, dynamic positions, full expression of hip movement, stability of the spine, all angles of shoulder control, dynamic core strength, it’s all encompassed in this single exercise. Utilize it as part of your warmup, or use it as a stand alone exercise. A drill most people like is a circuit with jump-rope intervals and Turkish Get-Ups. Get in some energy system training, as well as the strength and mobility benefits of the Get-Up. A good goal is to get to Ring Pushups. The instability of the rings, and the control required from the shoulder girdle and core has a lot of beneficial carryover to the sport. Most however need to simply start from the ground. Hip reconstructions aren’t fun from what I hear, so make sure you keep yours healthy. Once the movement of the hip joint is negatively impacted, it will inevitably effect your surfing, and not in a good way. Speed, power, strength, flow, and mobility. They’re critical aspects to a surfing-body. Think of mobility as controlled flexibility. That’s what you’re really after. Regain that lost range of motion in your joints, get them moving the way they’re structurally designed to, so that you can move effortlessly in the surf. These are fundamentals. For some of you, these will be goals in and of themselves. Improve, or achieve these basic movements so that your body is properly prepared for more dynamic training. Expand your athletic capacity so your body is capable of what surfing well, and with longevity requires. It’s your body, and your surfing. The health of your body will dictate the quality of your surfing. Don’t neglect it.